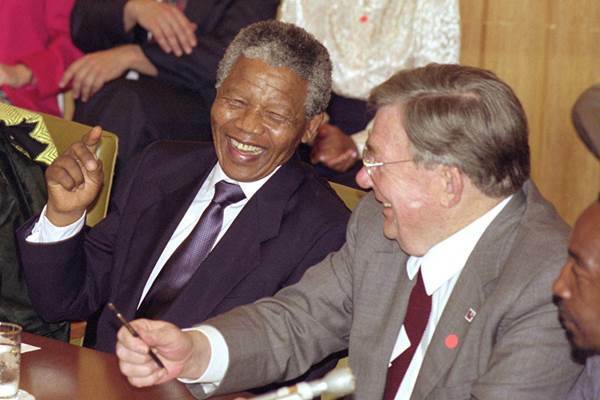 Former South African President Nelson Mandela, left, pictured with former AFL-CIO President Lane Kirkland, right, in 1990. Credit: Bill Burke, Page One. “President Mandela dedicated his life to fighting for democracy, equality and freedom. His legacy will live on in the hearts and minds of all who strive for a better and more just world. “Even as a political prisoner for over two decades in his own country, Mandela never strayed from his mission of ending oppression in South Africa. As president, Mandela ended apartheid, tackled South Africa’s inequality problem and became an international symbol for cooperation and reconciliation. We are a better world because of Nelson Mandela.